Critics of the government acknowledged that misinformation flourished on Twitter and other social media, with incorrect reports that the crackdown had resulted in large numbers of deaths, and digitally altered photos said to be of victims. But they added that the rumors spread because the established news media were guilty of a lie of omission. As the protests escalated during the weekend, some demonstrators redirected their anger toward media organizations. On Sunday, hundreds of people gathered outside the offices of one broadcaster, HaberTurk TV; on Monday, a larger protest took place at another channel, NTV, with employees of the channel joining in. On Tuesday, Cem Aydin, chief executive of Dogus Media Group, the parent company of NTV, apologized to viewers for the channel’s lack of coverage in the early days of the protest. For a country with democratic elections, Turkey has a robust tradition of suppressing free speech, on the Internet and in the mainstream media. A World Press Freedom Index published byReporters Without Borders, an advocacy group based in Paris, ranks Turkey a lowly 154th among 179 nations. “If you are a company in construction that is trying to get government tenders, you are probably going to be careful about what you let your media company say,” said Didem Akyel Collinsworth, a Turkey analyst at the International Crisis Group, an organization based in Brussels that works to defuse international disputes. This has highlighted the shortcomings of the main domestic news providers, critics say. One picture that has made the rounds widely on social media juxtaposes coverage on CNN International and CNN Turk, a Turkish-language news channel owned by Dogan. In the picture, CNN International shows fiery protest footage, CNN Turk a nature documentary featuring cuddly penguins. A spokesman for Time Warner’s Turner division, which operates CNN International, said the Turkish channel, which operates under license from Time Warner, is editorially independent from the English-language news outlet. The broadcast of the penguin program occurred in the wee hours of Saturday morning, after the channel had already broadcast coverage of the Friday demonstrations, a Turner spokesman in London said. “CNN is continuing to closely monitor the reporting of the protests in Turkey on our own channel, on our broadcast affiliates and across the competition,” the company said in a statement. Mr. Erdogan is not alone among political leaders in singling out the role of social media in fomenting street violence. After riots last year in London, Prime Minister David Cameron of Britain pushed — unsuccessfully, so far — to create new powers to monitor digital communications. Twitter declined to comment on Mr. Erdogan’s accusations, or on the arrests. In the past, the company has declined to disclose the identities of its users without a court order in the United States, where the company is based. 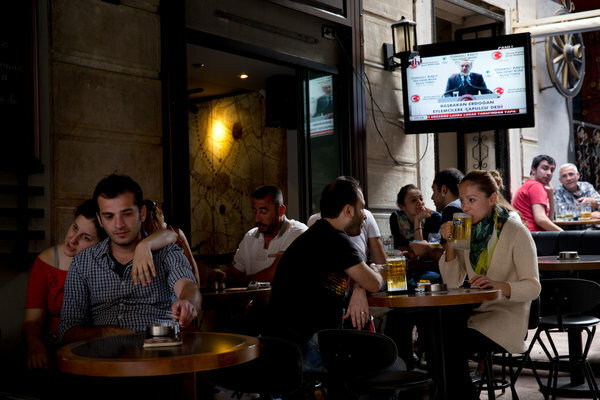 There are signs that worried, but Internet-savvy, Turks are turning to technologies that allow them to mask their digital identities. AnchorFree, a company that provides a virtual private network application called Hotspot Shield, said it had counted more than 98,000 downloads from Turkey on Saturday alone, or about 10 times the normal daily volume from that country.